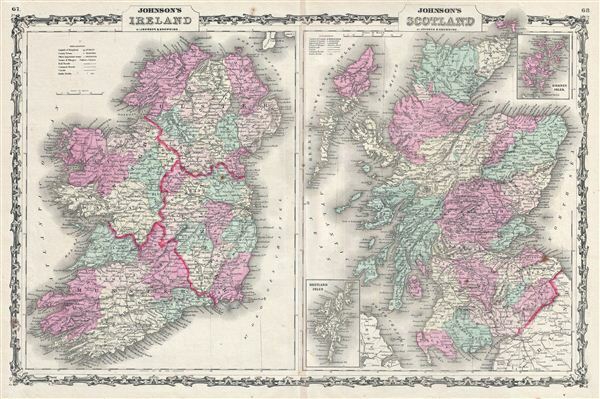 This is a beautiful example of A. J. Johnson and R. Browning's 1861 map of Scotland and Ireland. It contains two separate maps within the same border. The left hand map features Ireland and covers the entire emerald Isle in full from Donegal to Cork. Ireland is divided into its four primary provinces, Munster, Ulster, Connaught and Leinster. During the 19th century, Ireland suffered a series of famines, the worst one being the Great Irish Famine, which lasted from 1845 - 1849 and killed about a million people. As a result Ireland experienced a widespread exodus - mostly to the United States. By the end of the 19th century, almost 50% of immigrants into the United States were from Ireland. The right hand map covers Scotland in full from the Orkney Islands to Wigton in the South inclusive of the Hebrides. An inset map in the upper right quadrant details the Orkney Isles and another inset in the lower left quadrant details the Shetland Isles. As this map was being drawn Scotland was in the midst of the Industrial Revolution and emerging as the center of engineering and shipbuilding in the British Isles. The map is color coded according to regions and notes several towns, cities, rivers, and various other topographical details with relief shown by hachure. It features the strapwork style border common to Johnson's atlas work from 1860 to 1863. Published by A. J. Johnson and Browning as plate nos. 67 and 68 in the 1861 edition of Johnson's New Illustrated Family Atlas. This is the last edition of the Johnson Atlas to bear the 'Johnson and Browning' imprint. Subsequent editions reflect Ward's 1862 acquisition Ross C. Browning's shares in the firm. Very good. Minor toning along original centerfold. Some foxing.